Why Jane Austen taking over Hollywood? 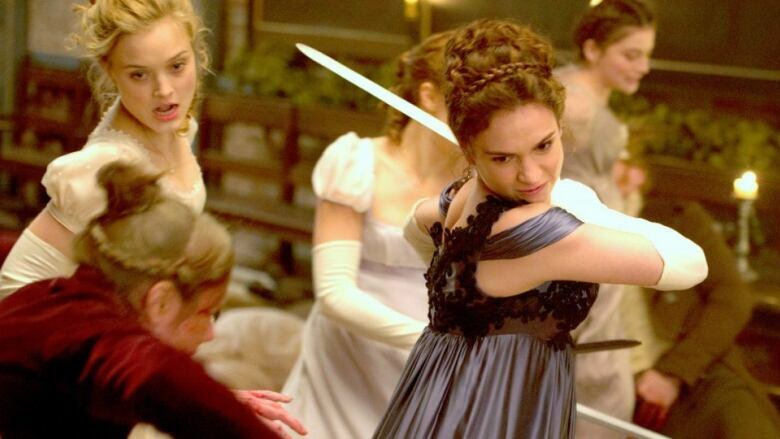 CBC Radio asked that question in 1996, and the discussion's still relevant 20 years later, as a spate of new Austen adaptations head to the big screen, including Love and Friendship, a new Bridget Jones and Pride and Prejudice and Zombies. Why is Jane Austen taking over Hollywood? Hear how CBC Radio answered in 1996. According to CBC Radio's Writers & Company, 1995 was the "Year of Jane Austen." You could have said the same of 1996, for that matter, and 1997, and pretty much every year that's followed right up until now. Blame Colin Firth and a certain scene you probably wore out on your million-volume Pride & Prejudice VHS box set — or, you know, the inimitable dialogue and narrative stylings of one of English literature's most beloved authors — but it is a truth universally acknowledged that producers love an Austen adaptation. On this day in 1996, the BBC's Pride & Prejudice miniseries was about to make its North American premiere, which is why W&C was discussing the Austen-in-Hollywood phenomenon, a micro-industry in itself that really began with the "Darcymania" of 1995, a year that also produced Emma Thompson's Oscar-winning Sense & Sensibility and Clueless, based on Austen's Emma. The latter is possibly the best modern re-imagining of a Regency Era novel (apologies to From Prada to Nada). Though Austen wrote just six novels, her stories continue to inspire film and TV productions — never mind action figures, coffee mugs and temporary tattoos — and 2016 already has a handful of Austen-related movies on deck. On the more traditional front, there's Love and Friendship, Whit Stillman's take on her novella "Lady Susan," which premieres at this year's Sundance Film Festival. On the more exploitational side, the romance of Elizabeth Bennett and Mark Darcy will be exhumed once more in Februrary for Pride and Predudice and Zombies. Even the adaptations of adaptations prove to bewitch audiences body and soul; Bridget Jones, whose first adventure was a re-imagining of Pride & Prejudice, returns to the big screen for a third time this fall. As W&C host Eleanor Wachtel put it in 1996, "Nearly 200 years after her death she became 1995's hottest screenwriter," and Austen's star status hasn't changed since. Twenty years ago today, Wachtel discussed Austen's Hollywood popularity with three experts, authors and scholars Fay Weldon, Marilyn Butler and Claire Tomlin. Together they try to answer why an author born in 1775 is one of the biggest power players in pop culture — a question still ripe to be pondered, even if the answer is simple to die-hard devotees. "It's just good business," says Weldon, "because the work is really very good."